The traditional toss to see who bats and bowls at the start of a cricket match has been part of cricket since the game’s inception. However, in the interest of sustainable Test cricket it needs to be done away with, allowing the visiting captain to make this decision. The reason for such a radical change needs to be implemented to ensure that Test cricket once again becomes a contest around the cricketing world. Historically winning Test series away from home has always been difficult but recently it has almost become impossible due to the doctoring of wickets to suit the home team under the guise of home ground advantage. In recent years any sub-continent team touring South Africa has been bullied by having to play on green bouncy wickets that suit the South African pace attack. 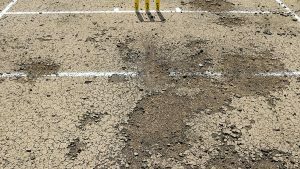 The recent tours by India and now Pakistan are evidence of these types of wickets being produced. When South Africa or any other non-subcontinent teams have toured the sub-continent in recent years, they have been bullied with wickets that spin from day one. South Africa’s recent tours to India and Sri Lanka are proof of this, when both teams picked only one fast bowler who bowled no more than a couple of overs in each Test. In reality these wickets were sub-standard, as have been the South African Test wickets. If the toss is taken out of the game and the visiting captain can decide whether he wants to bat or bowl first, it will make a big difference to the type of wickets being prepared. Also, the International Cricket Council (ICC) should ensure that there is enough time for at least two high quality first-class warm up matches so that the visiting team has a realistic chance of adapting to the local conditions. Pakistan’s only practice match on their current tour was against a very inexperienced South African team at Benoni that served no purpose for the tourists. The ICC needs to ensure, as far as possible, that Test series are a fair contest to capture the imagination and support of the cricket public. Presently only England, Australia and the West Indies provide wickets that are traditionally consistent. With Test cricket being under pressure they need to find a way of ensuring that all Test series are fair contests, otherwise Test cricket will continue to lose its appeal. « What’s happened to common sense?